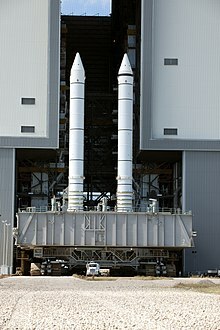 The Space Shuttle Solid Rocket Boosters (SRBs) are the rocket boosters used for the Space Shuttle and will be used for the Space Launch System. Each of the SRBs generate 13,800 kilonewtons of thrust during the first two minutes of flight. Before the rocket reached orbit, the SRBs were released and fell into the Atlantic Ocean where they were towed back to shore for reuse. STS-51-L was the 25th flight of the Space Shuttle and the 10th flight of Space Shuttle Challenger. 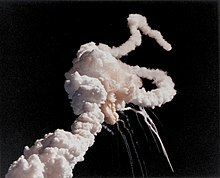 The shuttle broke up 73 seconds after take-off from Cape Canaveral on 28 January 1986. All seven astronauts who were on it at the time were killed. The crash happened because a rubber tube called an o-ring did not expand to fill a gap in one of the SRBs, due to cold weather. This page was last changed on 4 January 2019, at 09:33.